Total: 1 hr 20 Min. | Active: 30 Min. I must have baked well over 100 chocolate cakes in my lifetime but none have tasted as delicious as this one! The unusual main ingredient (sauerkraut) makes this cake extremely juicy and – whether you believe it or not – you won't taste the sauerkraut! As sauerkraut is very high in Vitamin C and the cake itself contains very little sugar, you can also eat it for breakfast with a clear conscience. Rinse the sauerkraut in cold water, squeeze out the liquid and chop finely. Combine the margarine, coconut palm sugar and vanilla paste. In another bowl, mix the flour, cocoa powder, baking powder, sodium bicarbonate and salt. Add the sauerkraut, margarine and flour mixture, mix well. Pour in the oat drink and vinegar, mix well once again. Transfer the cake mixture to the prepared tin. Bake for approx. 50 mins. in the centre of an oven preheated to 170°C. Allow to cool a little, remove from the tin. 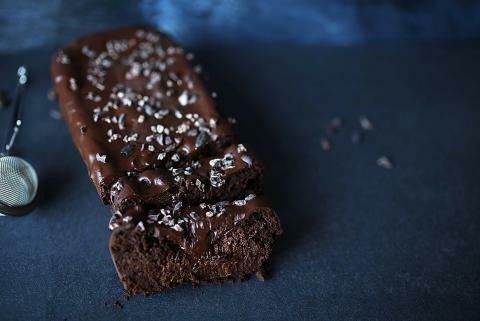 Melt the chocolate and coconut oil in a bain-marie, spread over the warm cake, decorate with nuts or cacao nibs.